Recipe courtesy of Georgetown Cupcake. Preheat the oven to 350 F. Line 1 standard cupcake pan with 12 baking cups. Sift together the flour, baking powder, cinnamon, nutmeg, and salt in a medium bowl. Place the butter in the bowl of a stand mixer or hand-held electric mixer. Beat on medium speed until fluffy. Stop to add the sugar; beat on medium speed and cream together until well incorporated, approximately 2 to 3 minutes. Add the mashed bananas and honey and mix slowly to incorporate in the batter. Add the pineapple, and mix slowly to incorporate in the batter. Add the pecans, and mix slowly to incorporate into the batter. Reduce the speed to low. Add one-third of the flour mixture to the butter mixture, then gradually add one-third of the hot water, beating until well incorporated. Add another one-third of the flour mixture, followed by one-third of the hot water. Stop to scrape down the bowl as needed. Add the remaining flour mixture, followed by the remaining hot water, and beat just until combined. Take care not to over mix the batter. Use a standard-size ice cream scoop to fill each cupcake paper with batter, so that the wells are two-thirds full. Bake for 24 to 26 minutes (start checking at 24 minutes) or until a toothpick inserted into the center of a cupcake comes out clean. Transfer the pan to a wire rack to cool completely. Place all ingredients in the bowl of an electric mixer fitted with the paddle attachment; beat until well combined. Be sure to beat on high speed for at least 1 minute to ensure that the frosting is light and fluffy. Line up cooled cupcakes on counter. Transfer the vanilla cream cheese frosting into a plastic piping bag, fitted with a large round metal tip. Apply a “signature swirl” of frosting on top of each cupcake, by starting in the center of the cupcake, and applying pressure to the bag, and going around the cupcake in a circular motion, then ending again in the center with a burst of pressure. Knead a small about of blue (or color of your choice) gel food color into a piece of white fondant to achieve a light blue color. Using a rolling pin, roll out a thin sheet of light blue fondant. Dust with edible luster dust if using. Using a mini bird-shaped cookie cutter, cut out fondant hummingbirds. Let fondant harden for 2 to 3 minutes. 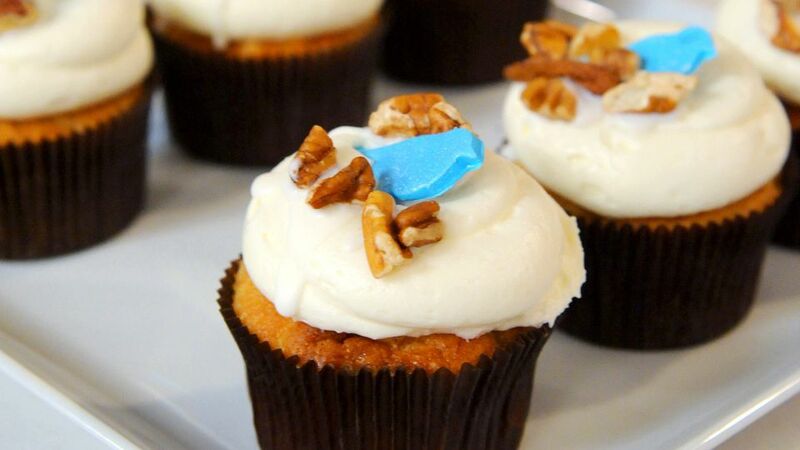 Form a small pile of chopped pecans on each cupcake and place the fondant hummingbirds to sit on top of the pecans.